The bus crushed the river flow. A sudden dull thump. The wheels are submerged completely for few moments, the stream gently rocking the vehicle. I instinctively reach for the seat in front of me but before I can complete the move we are already driving out of the river. Water drips from the undercarriage leaving a wet trail behind us. Shortly afterwards the bus screeches to a halt. 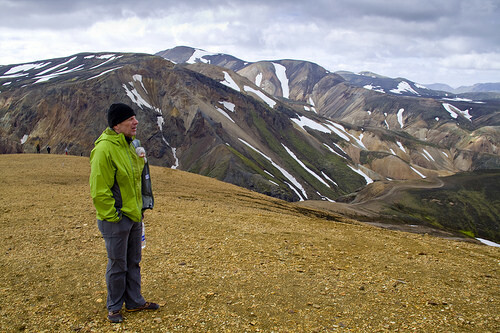 We have arrived to Landmannalaugar. There is a hut for those who booked early. It offers simple necessities, bunk beds and a small kitchen/dining area with stove and hot water. 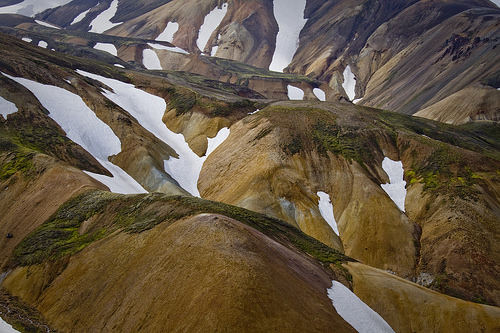 The cost is 7,000 Icelandic kronas per person. At 1,600 kronas per person, camping is cheaper, and if you haven’t booked several months in advance, the only option. Bathrooms and showers are shared. Warm water comes from a hot spring and is at no additional cost. At the end of the parking lot a green bus serves as a bistro offering hot beverages and small snacks, all at premium prices. The first thing I notice when we disembark our bus is a steam rising from a meadow nearby. From my current vantage point I cannot see the hot spring which produces it and it seems as if the ground itself was smoking. The view is unique to my eyes accustomed to the scenery of the Pacific Northwest. The second thing I take a notice of is rain. Sneaky drizzle covering us in tiny droplets. 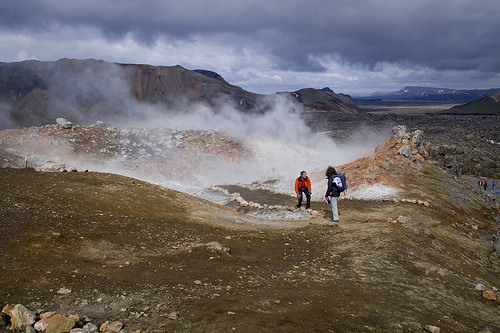 Several hiking trails crisscross the region, from short easier ones showcasing noisy hot springs and amazing lava fields to longer options climbing to mountain tops with views of colorful hillsides. When the rain ceases in the mid afternoon we set out for approximately 5 miles long loop promising a good sample of the region. 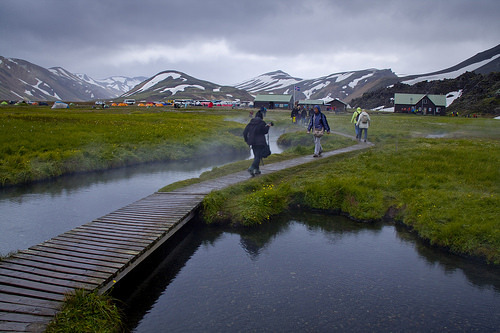 The trail heads deeper into the valley, away from the hut and clusters of visitors hovering around it. The first part is flat taking us to a river which we do not cross. Instead we take a 90 degree turn to follow the river upstream through a canyon where for the time being we are protected from the biting wind. 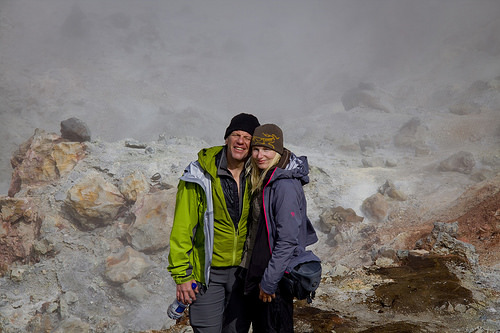 Smell of sulfur welcomes us at the top where steam hisses from several fumaroles. The area touched by the activity carries light gray colors with stains of rusty orange and a little bit of white. 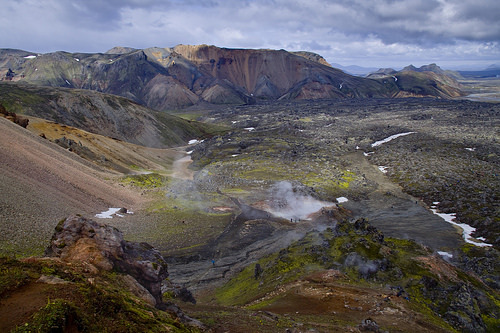 Shorter loop can be accomplished by returning to the hut via lava field nearby. Our goal is to continue further to the top of Brennisteinsalda, the most colorful mountain in the country, from where we can drop to the plain west of Laugahran. 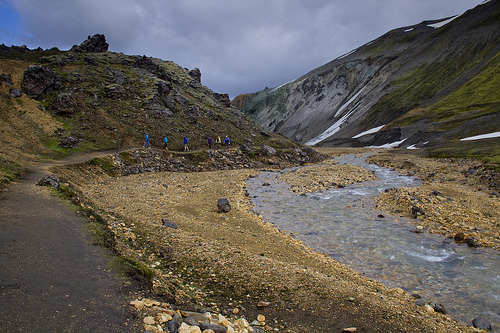 The trail to the top of Brennisteinsalda allows us to appreciate the barren hillsides, unseasonally sprinkled with snow and colors of red and green at areas where the snow has melted. Our effort is rewarded not only by the vistas but also by a kiss of the sunshine while we are at the summit. On the other side there is more vegetation. After the initial steep descent the trail flattens and takes us across the plain. The route is marked by short wooden poles but there are several marshy areas where we have to be little creative to proceed. The final part of this loop takes us through the Laugahraun lava field. The rock is tall, dark colored. Rhyolite mostly which is volcanic rock with the equivalent mineralogical composition of granite. The rain returns before we have a chance to arrive back at the camp. This time it’s a strong, full fledged shower beating on our gore-tex jackets and pants. Our initiation to Iceland has begun. Tomorrow we only have 7.5 miles to reach Höskuldskali hut at Hrafntinnusker where we’ll camp for the night but between us and the hut, there is still a large amount of snow. Are we ready to snow camp in Iceland? Nice, Gabi! My brother in law is from Iceland. Would like to go someday! Wow, what a stunning adventure!